A classy, spirit-driven project from the team behind Spruce and Village Pub. : Bacchus Management Group hits the mark yet again with this classy gem lodged deep in the gritty heart of San Francisco's Polk Gulch. Patrons are swiftly swept into the inky frenetic swell of the dark upstairs lounge, with its black leather-clad bar and crisp-linened four-tops. 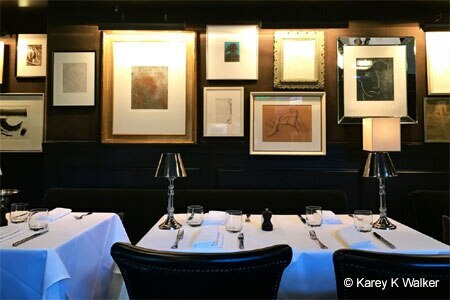 The intimate downstairs dining room features plush banquettes and mohair walls, punctuated by framed period art and yet another bar. Spirits dominate the menu, and cocktails are organized by their preparation (think shaken versus stirred). A simple dinner menu is quite approachable, with the likes of croquette-style "Toga Tots" with chorizo aioli living alongside seven-spice chicken sliders drenched in white sauce and dill pickle. A supple berbere chicken paillard is wonderfully executed, and the savory sea-salt potato confit makes a worthy pairing. The signature burger comes with Taleggio cheese and slaw on an onion bun. A mischievous dessert menu acknowledges the neighborhood with nutty house-made cracker jack, and sweet "Ho-Hos" of chocolate roulade, and we would return for the addictive black-label "Scotchy Scotch Scotch" pudding.